I have Adrenal Insufficiency and over the past few weeks I’ve been feeling a little bit scared. 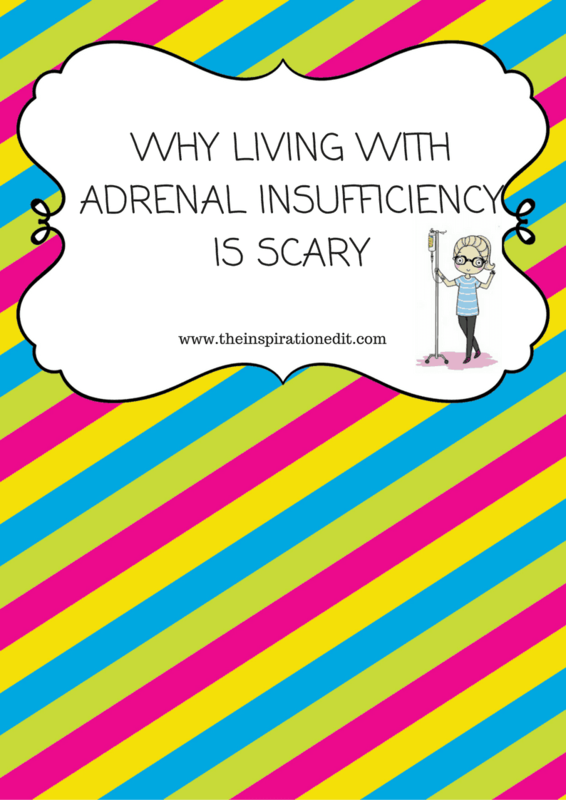 Adrenal Insufficiency causes me to feel scared at times and it’s a real and genuine fear. I try to be strong and brave. I try to have courage and fight for the best treatment and I do all I can to manage my health but at the end of the day Adrenal Insufficiency is scary and at times I feel scared. Like any illness when your undiagnosed it is bound to be scary. Up until the point I was told in hospital that I had suffered an Adrenal Crisis and had a condition called Adrenal Insufficiency I was scared. I didn’t know what was wrong with me and not knowing why your collapsing and sick can be a scary stage to be at. 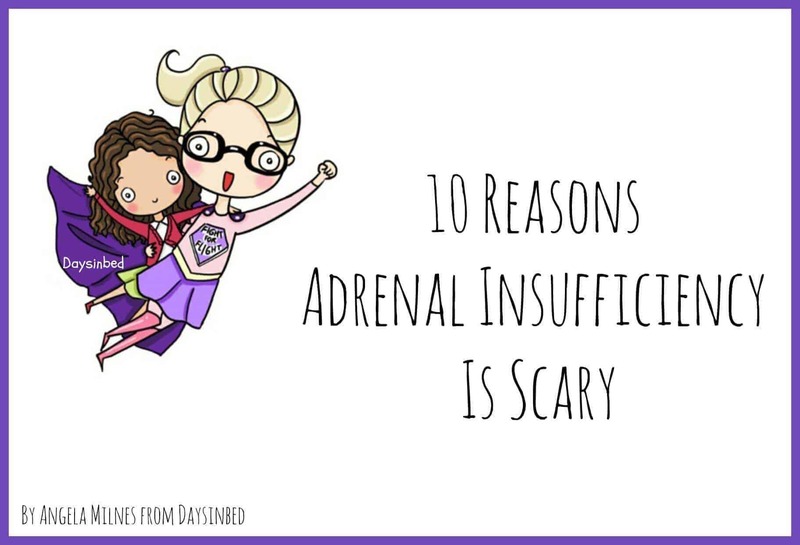 Getting diagnosed with Adrenal Insufficiency can be really scary. Learning about an illness you often have never heard of or come across before can be overwhelming. Having to research and read to find out what is wrong. Learning you will be forever dependent on steroids and medication and that you will need to carry an emergency injection with you is scary. Finding out that without medication you will go into an Adrenal Crisis which will result in emergency care and potential death is scary. Adrenal crisis is no joke. It’s a daily concern and something that needs to be monitored always. Having to have a MRI brain scan, undergo many blood tests, day curve tests and hospital investigations can be scary. 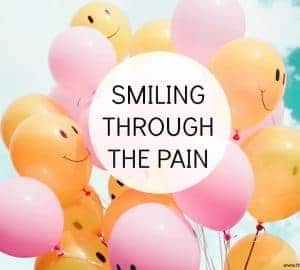 Going from healthy and happy to needing test after test after test can be scary especially when it’s a new situation and something your not used to. Being a Mother with Adrenal Insufficiency is Scary. When there is a chance you could become adrenally low in front of your child, or go into crisis. When there is a chance you may be separated form your child each time you become unwell. That can be scary. Being a parent or partner of an Adrenal Insufficient can be very scary. Parents can be afraid, afraid to send their child to school knowing the risk and worrying, “what if my child becomes suddenly ill”. 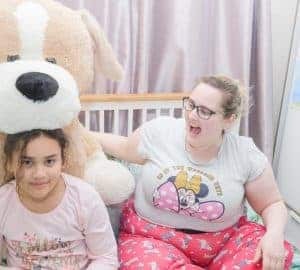 Adrenal Insufficiency can happen suddenly and parents can’t possible know what it feels like. This must be scary. Likewise partners and family members have the job of monitoring one with Adrenal Insufficiency. A scary responsibility. One thing that scares me about Adrenal Insufficiency is the fact it’s a rare condition. It’s not as well known as diabetes or cancer or asthma. There is far less research and not enough being done to help patients with the condition and that is a scary prospect. More needs to be done and more awareness raised. More research and better treatments and sadly patients suffer daily and others die because the condition is not well managed. What I find scary about Adrenal Insufficiency is the fact many of the Medical staff who have treated me have been very unaware of my condition. I have been asked what medication I need. Some ambulance staff had never heard of Adrenal Crisis and other staff have not taken the condition serious through lack of awareness and I find that scary. I find fighting for better treatment scary. I was scared fighting for the adrenal pump. What if it did not work? What if my health never improves? What if I can never get managed? Luckily after some time my health steadily improved and became more stable but I’m still scared. What if I don’t manage to raise the money for my own pump? What if I can’t afford the medication? These thoughts are scary but I have to be strong and keep fighting and believing I can get the right treatment permanently. Fighting for the best treatment is scary. Last but not least speaking out about Adrenal Insufficiency. It is a scary thing. What if the doctors or specialists get annoyed? What if no one want’s to listen? It can be a scary thing putting yourself out there and speaking about Adrenal Insufficiency. It can be scary fighting for change for better awareness and knowing that some will get annoyed or disagree with what you say. However I must speak out and raise awareness. No matter how scared I may be. Adrenal Insufficiency can create feelings of worry, of being scared, of fear, confusion and doubt but we do not have to give in to these feelings. We- The Adrenal Insufficient’s, We – The family and friends of Adrenal Insufficient’s can fight this. We can raise awareness. We can have hope. We can fight for change for better treatment, for more research and for all we deserve- because we are humans. Yes we may be suffering but it does not have to be in vain. We can stand for what we believe. Shout out and do our part to raise awareness and let others know how real this fight with Adrenal Insufficiency Is. To read more about Adrenal Insufficiency and my own experiences with the condition please do visit my page The Adrenal Diaries. How ’bout arrogant ER docs who let you have diarrhea and barf all over the place while insisting you have a blood test to show if you’received having a crisis, rather than preventing it from getting worse? Yep… I’ve experienced that one too! There are so many! They called mine Panic Attacks! Told me I wasn’t sick-go to the garden and work when I was in emergency at 2 in the morning-told me I was putting on everything while I sat and cried and was so scared I would die-told me NOTHING like what I was describing-I have heard it all from OREGON doctors that are so incompetent, I could barf. They don’t want to listen! I am total disgusted with the likes of most of them. This disease is very traumatic and very little is understood about it and they don’t want to learn! I have been fortunate that my doctor has been willing to research and learn. It’s been a struggle. I do not metabolize HC in pill form and that took some time to figure out. Once he relized all AI patients really aren’t the same treatment has been much better. Still there is alot to learn, it’s tricky with multiple autoimmune issues. It can be hard with more than one condition and on its own. I agree. I found it helpful to tell the ER staff that this condition is “similar to Addison’s Disease”. Most Dr’s and nurses are more familiar with that, and I do believe that they understand the risk of adrenal crisis then. Worth a try! Yes I often have to say this. A and E is often better than ambulance staff too! My husband has Addison’s Disease, & along with it, Hashimoto’s (affects the thyroid). He’s been steroid dependent for 13 yrs. For us, the key is consistency with meds & monitoring any illness (sinus, cold/flu, viruses) closely & going to the doc early on when symptoms occur. We all get the flu shot annually since the flu is what brought his condition to light when I was 6 mths pregnant with out 13 yr old. Docs say he had several “flags,” but they didn’t all come together until then. They also mentioned his excessive intake of salt had kept his head above water for no telling how long. Low blood pressure & fatigue can be biggies for us. Thank you for sharing your experiences with AI. Thanks for reaching out Kirsty. Sorry to hear your hubby has AI. It can be very hard to monitor and thanks for commenting.